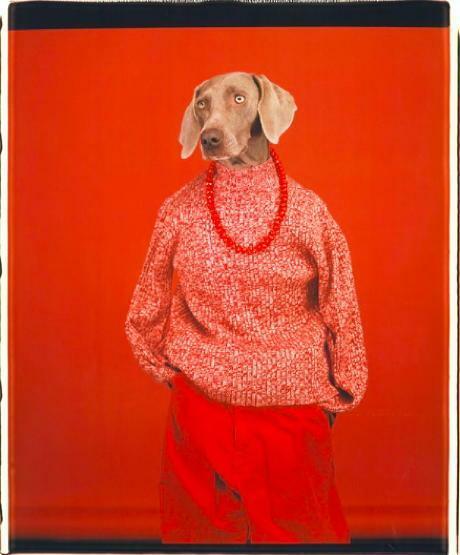 William Wegman, Décontracté, 2002, with kind authorization from the artist. Exhibition at the Palais de l’Archevêché, Arles. ARLES –The iconic photography festival, the Rencontres, founded by Lucien Clergue, Michel Tournier and the poet Jean-Maurice Rouquette (the last survivor of these three musketeers) are celebrating their 49th edition. This is the fourth edition for the current director, Sam Stourdzé, who was not born at the inauguration in 1970, as he was born in 1973. The anniversary – 1968 – makes all commemorations obvious. It is mandatory for its Parisian revolutionary content – the barricades-, more so for the changes in the way of living - vacations at the Grande-Motte-, more so for its American dimension (the death of Martin Luther King and Robert Kennedy, the first edition of the mythic book by Robert Franck, Les Américains published by Delpire, re-published at the right moment. The trip includes Raymond Depardon, used to the country of Uncle Sam for over half a century, and much younger imitators such as Laura Henno (who took snapshots of the former military base of Slab City transformed into an informal town of old rundown buses) or Palestinian photographer Taysir Batniji, who documents the life of his cousins in the USA. The title, “America Great Again” sounds like Trump, but it is to be read tongue in cheek. • Les Rencontres de la photographie at Arles, from 2 July to 23 September 2018. View of the exhibition. Photo R. Pic. SAINT-PAUL-DE-VENCE – We have known for some time that Jan Fabre was an iconoclast. But he goes one step further by dedicating his last retrospective to the theme of the brain. During the inauguration he explained ”A brain with an arrow across its should be engraved on tree trunks, not a heart”, underlining the paramount importance of this organ in all passions, that is, in life itself. Here we see a multiplication of hemispheres, in Carrara marble, in black marble from Wallonia or in silicone. Certain pieces make us smile – the pseudo-brains of Wittgenstein, Einstein, Gertrude Stein, Frankenstein, symbolizing philosophy, science, the arts, and darkness. Others are more disturbing, such as the molds of his father’s and mother’s brains, refreshed with little fans. • Jan Fabre. Ma nation : l’imagination at the fondation Maeght, from 30 June to 11 November 2018. Ernesto Neto, GaiaMotherTree, Zurich Station. Photo : Mark Niedermann. ZURICH – Brazilian artist Ernesto Neto has taken over the most prestigious cultural venues, such as the Panthéon in Paris, the Guggenheim in Bilbao, with his rhizomatic installations, made with nets and slack shapes. With the support of the Fondation Beyeler, he has set up in the train station of the largest Swiss city his new work, GaiaMotherTree, the expression of his concern for our planet. As his other works, this is not an untouchable creation but rather a site visitors are invited to make their own. It is completely made of naturally dyed, hand-knotted materials and illustrates his relationship with the Amazon tribe, the Huni Kuin. The suspended pockets are filled with spices and dry leaves that diffuse a pleasant odor, as if to illustrate what we would lose if global warming continues. • Ernesto Neto, Gaiamothertree, 2018, central station in Zurich, Fondation Beyeler from 30 June to 29 July 2018. RENNES – He is a native Breton and is simply paying it a tribute. While the current events around Pinault regard his definition of “the little people” and the lack of interest Macron demonstrates for them, the industrial leader presents a selection of his 3000-work collection in the regional capital. His works are more used to the Venetian venues such as Palazzo Grassi and Punta della Dogana, and very soon – at the end of 2019 but the date could change- a Parisian site, the former Bourse de Commerce. Here three venues, the Couvent des Jacobins, the musée des Beaux-Arts, and the Criée, welcome classic works by Cattelan, Lavier, Pierre Huyghe, the Chapman brothers, as well as by the business man’s latest discovery, Vincent Gicquel, born in 1974. • Debout ! La collection Pinault à Rennes from 23 June to 9 September 2018. BILBAO-TOULON – She had created a sensation at the Biennale of Venice in 2005 with her lovely looking chandelier – but disconcerting as a closer look showed it was made with sanitary tampons. Portuguese artist Joana Vasconcelos, born in 1973 in Paris, living in Lisbon, is post-Pop through her use of motifs and everyday objects (such as embroidery, or azulejos, pots or mirrors which she enlarges, transvestites, combines, turns away from their initial function. The resulting creations have a polychrome and sculptural dimension that turns them into true decorative objects, but are mostly aberrations that question the viewer. The artist, already honored by Versailles, is honored twice, in Spain and in France, a sort of assessment of twenty years of activity. • Joana Vasconcelos. Je suis ton miroir at the Guggenheim Bilbao, from 29 June to 11 November 2018. • Joana Vasconcelos à l’Hôtel des arts de Toulon, du 13 juillet au 18 novembre 2018. Next to the photography books that simply show a series of images or properly unreel a biography, her we have a surprising one. It starts with the fascination René Burri (1933-2014) had for the triangle motif – born it seems from the Swiss peaks of his childhood and consolidated by the vision of Egypt’s pyramids in 1958. A few notes in German on Magnum header paper (reproduced on the frontispiece) confirm this obsession. We then follow the revival of this form for half a century. We see pyramid everywhere! In the gravel of zen gardens, in a broken window, in the Flatiron Building seen from the sky, in tepees on Route 66, in the architectures of Barragán and Le Corbusier, or in a pavement in Havana. Sometimes they are less obvious but that adds to the interest of this book, as it forces us to look and not only to see.